WideOpenWest, the telecom company known to some as WOW!, is acquiring cable TV and Internet provider Knology. To finance it, WOW is arranging a $1.92 billion loan from a group of banks. The loan will be sold at a discount (95) to make it appealing to investors and is paying LIBOR + 5% with a 1.25% LIBOR floor. The banks will provide the initial financing and will then sell (syndicate) most of the loan to investors. Investors in this loan are exposed to LIBOR, yet there is no shortage of such investors - from CLOs to mutual funds. The asset class can be volatile because these firms tend to be non-investment grade (WOW for example is single B rated.) But in spite of the LIBOR scandal and market volatility, these LIBOR paying loans have performed well recently, as shown by the S&P leveraged loan index below. Demand for securitized LIBOR based product has also been strong. 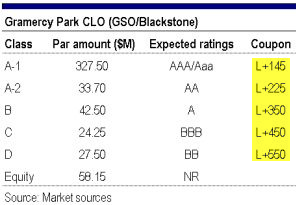 Blackstone just completed a half a billion dollar CLO (priced by Citigroup) with all the tranches (as well as the collateral) being LIBOR based. And Citi apparently had no trouble placing the LIBOR based tranches. 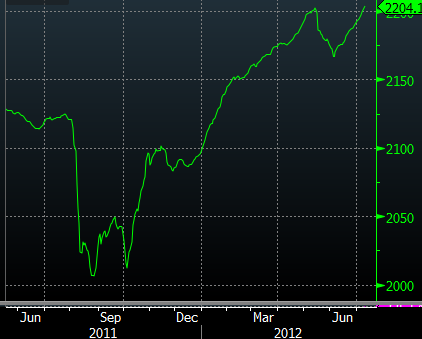 Even retail investors keep buying LIBOR product. As an example consider the Eaton Vance Floating-Rate Fund (ticker symbol EABLX) that focuses on leveraged loans. The mutual fund (which is up 4.4% YTD) is over $7bn in assets and growing. Following Barclays’ admission of misconduct, flows into such mutual funds have kept up, adding $357 million between June 28 and July 9 (according to EPFR) in spite of the turmoil in Europe. According to LCD, managers for such funds as well as separately managed loan accounts have seen no letup in new cash. People want these products because they provide current income and protect against rising rates. If rates spike, LIBOR will go up (supposedly), increasing coupon payments on these loans. With all the regulatory actions and pending lawsuits associated with LIBOR, investors just yawn and keep buying more LIBOR based product. The Barclays LIBOR scandal has so far not deterred investors from continuing to bet on LIBOR - an artificial index that is not based on actual transactions. The market still relies on a bunch of assistant bank treasurers "guessing" a daily number that they send out to the British Bankers Association. Old habits die hard.